All I’ve ever wanted to do was explore a haunted house with my friends. Unfortunately, I’m an absolute scaredy cat and never got up the courage to enter an abandoned house with a creepy backstory. Luckily, Creeping Terror gave me that experience on my 3DS without me ever needing to leave my bed! While not a perfect game, Creeping Terror provides you with just the right amount of creepy, bringing a solid chill to the air while you play. 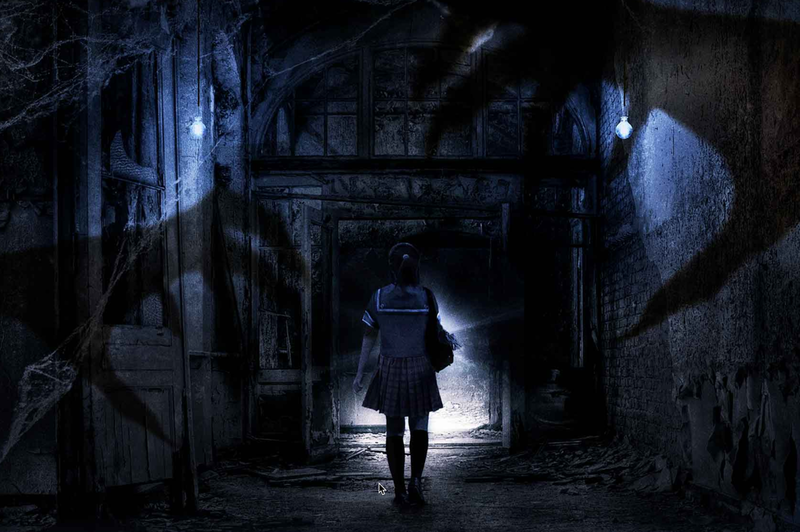 The game starts with four teenagers exploring a haunted house in order to film a spooky video. You play through the game as Arisa, a Japanese teenager in a school uniform. There’s an odd comment towards the beginning of the game asking why Arisa is the only one of these teenagers wearing a uniform. Bob, another member of the group, jokes about her wearing it in order to get more views on his video, which almost immediately left a bad taste in my mouth. What tried to be a self-referential comment turned into a slightly sexist joke made to explain lazy costume design, making for an unfortunate beginning to an otherwise fun game. After the teenagers enter the haunted mansion, Arisa quickly gets separated from her group and spends the rest of the game trying to find her friends. There are about twenty minutes of walking around and cutscenes before you actually get to anything slightly scary. The moment in which you finally meet the game’s monster is pretty well done, though—he’s decently creepy looking with his giant trench coat and shovel, especially when considering the pixelated graphics (definitely not something I’d want to run into while trapped in a broken-down basement). From there, you run around as Arisa and explore this creepy mansion and the surrounding areas while discovering the secrets of the past inhabitants in an attempt to reunite your friends and escape. The entire game is played in two dimensions, moving left and right to explore different parts of this creepy mansion. You can defend yourself a bit from the bad guys you run into by throwing rocks and such at them, but there’s no real combat mechanic—you must either outrun them to a “safe room” or find a hiding spot until they go away. Despite the simplistic gameplay, I still found myself wishing that the game had a more fleshed out tutorial. While I’m someone who definitely gets frustrated by tutorials that go too long, in this case there were certain things about it I didn’t realize until I’d already made decent progress. For example, I didn’t find the button to get Arisa to run for the first part of the game, which made for some difficult escapes. There was no indication at all that Arisa even could run, unless you looked up the settings for assigned buttons. The mechanic behind using the hiding spots also wasn’t intuitive, as it wasn’t fully explained when hiding would work and when it wouldn’t (I got ripped out of my hiding spaces a few times because of this). It was really frustrating, and a couple of lines of explanation when entering the first fights would have been incredibly helpful here. For those who enjoy finding and collecting items, there are a ton of documents to find within the game that provide the backstory of the people that used to inhabit this mansion. While a couple of these do directly pertain to the game, most exist only to provide extra in-world lore. These journal entries and written documents were often incredibly easy to find—without really trying too hard, I was able to collect 97% of them before the game’s end. While it’s nice that the game wasn’t frustratingly difficult, I found myself somewhat bored at times due to how easy it was to find whatever you needed. I had to keep using health rations and phone chargers when my life or battery was near full, as there were more in the game than ever necessary. The strengths of this game definitely lie in the graphics and music. The graphics look fantastic when played in 3D, adding a fun perspective to the two-dimensional gameplay. I don’t usually put my 3DS in 3D mode, but in this case it was worth it. In addition, the music definitely added a chill to the air. While this game isn’t super scary, I felt goosebumps on the back of my neck a few times when playing this game alone in my apartment. During fights, the music takes on a frantic and exciting feel, adding a sense of suspense and drama. One of the most frustrating moments of the game came when I was told to explore the mansion, but found I was actually supposed to explore outside the mansion. This then spurred an objective surrounding a crow that had nothing to do with the plot. I was taken to a place I’d already found—but now the area was searchable. It felt like a pointless quest made for the sole reason of extending the game a bit. From start to finish, the game took me around three and a half hours to play, and you’re told at the end of the game that there are multiple endings to discover. Overall it’s a nice game, and while it won’t provide any real scares, it has just the right amount of creepiness for anyone who wants a spooky experience without any jumps. Creeping Terror is a fun pixelated game that won’t make you jump, but will likely raise the hairs on the back of your neck. The overly simplistic gameplay is made up for by the excellent music and graphics, which work together to give you a creepy good time.